An artist's impression of how the Alfred's Way shopping centre in Batley could look. Major plans to transform parts of an old shopping precinct into a ‘cultural learning centre’ have taken a step forward after being given the backing of a council chief. Kirklees Filmmakers’ ambitious proposals to regenerate Alfred’s Way by opening the Batley Urban Arts Village were agreed following a meeting between director Meirul Din and the leader of Kirklees Council, Coun David Sheard. The last business in the shopping centre closed almost three years ago and meetings were then held by the late MP, Jo Cox, on how best to transform the site. The plan drawn up by Kirklees Filmmakers is to utilise the empty units by creating a virtual reality suite with additional editing suites, an internet room and cafe and studio space. 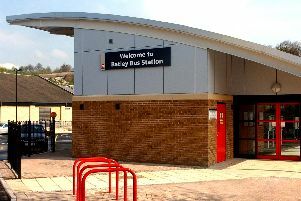 Mr Din said: “The Batley Urban Arts Project would see the shops create a digital hub for young people and there would be scope for businesses as well, by offering affordable, low-cost and easily-accessible space. “Arts would also play a central part in most of what happens in the Alfred’s Way with a small collection of creative learning art related spaces. The hub will be used to run workshops for young people to develop their skills in filmmaking, animation, art and IT. There will also be scope for start-up businesses by offering low-cost space. Key figures involved in the project includes Jo Cox’s manager, Fazilla Aswat, and community leaders Andrew Marsden of the Batley and Birstall business and retail association, Mark Griffin from Batley Smile, Richard Martin of Batley Community Alliance and historian Malcolm Haigh. Kirklees Filmmakers is now in talks with neighbouring Tesco about the plans with the next step to look at potential ways to fund the scheme.